iv. "Partner" refers to a third-party entity with whom Carrier Midea India Private Limited has created a version of this Internet Site or whom Carrier Midea India Private Limited has authorised to link to this Internet Site or with whom Carrier Midea India Private Limited has a joint marketing relationship. By accessing, browsing, and/or using this Internet Site, you acknowledge that you have read, understood, and agreed to be bound by these Disclaimer and comply with all applicable laws and regulations. We grant to you a limited, non-exclusive, non-transferable, revocable license to use the Internet Site only for managing your purchasing process, including viewing, requesting, approving and ordering products for yourself or on behalf of your company. As a licensee of the Internet Site you may not rent, lease, grant a security interest in, or otherwise transfer any rights you have in the use of this Internet Site. You further are not authorized to resell the purchase management and processing services of this Internet Site. Carrier Midea India Private Limited and its partners do not warrant that your use of the Internet site will be uninterrupted, that messages or requests will be delivered, or that the operation of the Internet site will be error-free or secure. In addition, the security mechanisms implemented by Carrier Midea India Private Limited and its partners may have inherent limitations, and you must determine yourself that the Internet site sufficiently meets your requirements. Carrier Midea India Private Limited and its partners are not responsible for your data whether residing on our or your servers. You shall be responsible for all use of your account and maintaining the confidentiality of your password and information. We discourage your sharing of your password and account number with anyone; any such sharing shall be entirely at your own risk. Accordingly, you should select a unique, non-obvious password and change your passwords often. The Carrier Midea India Private Limited Internet site and its contents are provided "as is" and Carrier Midea India Private Limited and its partners make no representations or warranties of any kind with respect to this site, its contents or any product. 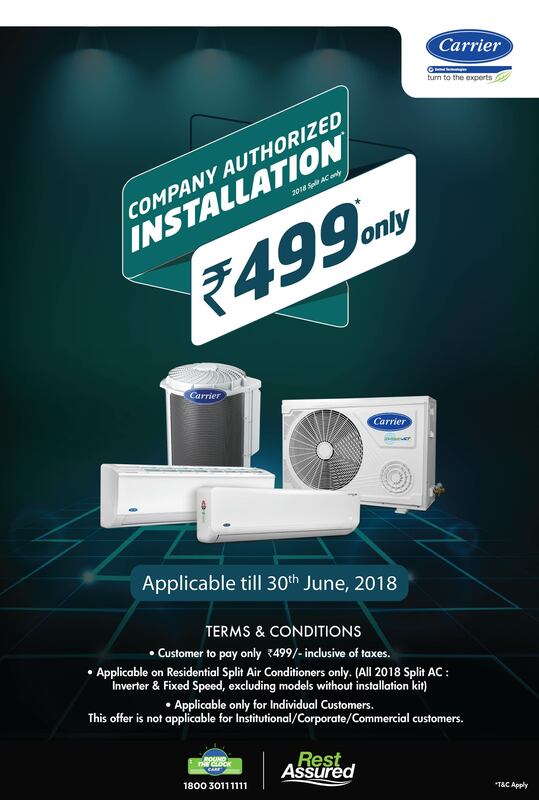 Carrier Midea India Private Limited and its Partners hereby expressly disclaim all warranties, either express or implied, of merchantability, fitness for a particular purpose, or non-infringement. 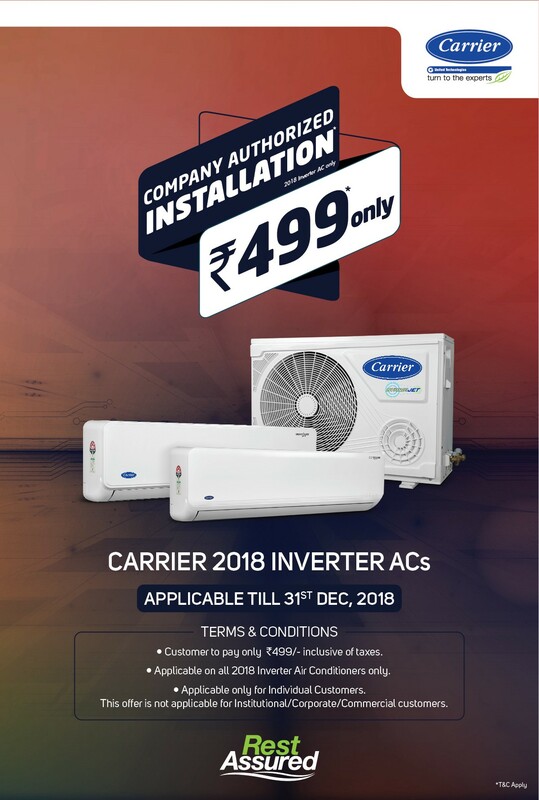 This disclaimer by Carrier Midea India Private Limited and its Partners in no way affects the manufacturer's warranty, if any, which shall be passed onto you. Carrier Midea India Private Limited, its Partners, its suppliers and resellers shall not be liable for any direct, indirect, special, incidental or consequential damages (including, but not limited to, damages for lost revenue, lost profits, business interruption, lost information or data, computer interruption, and the like) or cost of procurement of substitute goods or services arising from or related to the use of products or the use or inability to use this Internet site, even if Carrier Midea India Private Limited and/or its Partners shall have been informed of the possibility of such damages, or for any claim by any other party. Carrier Midea India Private Limited and its Partners do not represent or warrant that the information provided on this Internet site is accurate, complete or current. These limitations shall survive any termination of this agreement. All title, ownership rights, and intellectual property rights in the Internet Site shall remain in Carrier Midea India Private Limited, its Partners and/or its suppliers. Copyright laws and treaties protect this Internet Site, and you shall not remove any proprietary notices or labels on the Internet Site. Through the use of this Internet Site no intellectual property rights will transfer to you. Carrier Midea India Private Limited and the its Partners reserve the right to update and upgrade the Internet Site at our sole discretion without notice to you, including but not limited to, changing functionality, user interface, procedures, documentation, or any of the terms and conditions of this Agreement. Carrier Midea India Private Limited further reserves the right to modify any of the terms and conditions contained herein and in the policies by posting them on the Internet Site. If any update, upgrade or modification is unacceptable to you, your only recourse is to discontinue your use of the Internet site. Your continued use of the Internet site following any change in our site or posting of a new agreement on our site will constitute a binding acceptance of the change. Under the foregoing license, you are prohibited from modifying, translating, recompiling, disassembling or reverse engineering or otherwise attempting to derive the source code for the operation of the Internet Site or creating derivative Carrier Midea India Private Limited based on the Internet Site or parts of the Internet Site. For purposes of this Agreement, "reverse engineering" shall mean the examination or analysis of the Internet Site software to determine its source code, structure, organization, internal design, algorithms or encryption devices. This license will terminate automatically upon our notice to you if you fail to comply with the terms and conditions described herein. Carrier Midea India Private Limited has the right to terminate the license of any user at any time for any or no reason. Such termination may be based solely on the discretion of Carrier Midea India Private Limited and/or its Partners. Carrier Midea India Private Limited and its Partners will not be responsible or liable to you for any delay or failure to perform under this Agreement if such delay or failure results from fire, explosion, labor dispute, earthquake, casualty or accident, lack or failure of transportation facilities and/or services, lack or failure of telecommunications facilities and/or services including Internet services, epidemic, flood, drought, or by reason of war, revolution, civil commotion, blockade or embargo, act of God, any inability to obtain any requisite license, permit or authorization, or by reason of any law, proclamation, regulation, ordinance, demand or requirement of any government or by reason of any other cause whatsoever, whether similar or dissimilar to those enumerated, beyond the reasonable control of Carrier Midea India Private Limited and its Partners. This Agreement represents the complete agreement concerning this license and may be amended only by a written amendment executed by both parties. If any provision of this Agreement is held to be unenforceable, such provision shall be reformed only to the extent necessary to make it enforceable. You represent and warrant that, as the individual electronically agreeing to the terms of this Agreement, you are authorized and empowered to agree to this Agreement on behalf of yourself and any organization that you purport to represent.